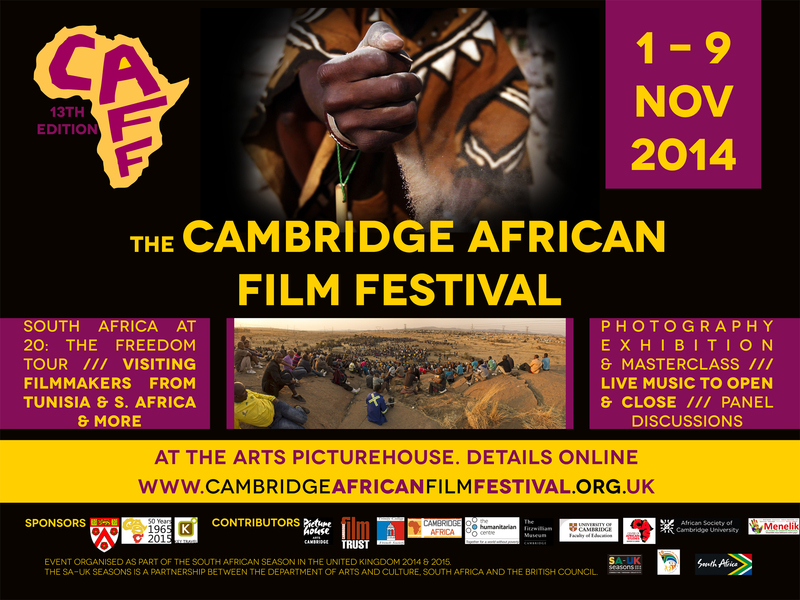 The Cambridge African Film Festival celebrates its 13th edition. Over 10 films and a South African focus. The longest running African film festival in the UK returns to the city of Cambridge from 1 to 9 November, showcasing more than ten films from a variety of countries, including South Africa, Mali, Senegal, Tunisia, Cameroon and Nigeria. The Cambridge African Film Festival (CAFF) opens with Timbuktu, by one of the leading lights of African cinema, Abderrahmane Sissako, which impressed the audiences at Cannes 2014. True to its original goals, CAFF 2014 aims to show the best of contemporary African films, increase understanding and awareness of African and black culture in the UK, and build a UK audience in the beautiful city of Cambridge for African filmmakers, while offering an important counterbalance to the Western media’s stereotyping of Africa. Most screenings are followed by a Q&A, either with the director, or students and academics at the University of Cambridge. In collaboration with The Humanitarian Centre, there is also a panel discussion showcasing various projects aimed at empowering young Africans through film. This year CAFF has joined forces with other UK African film festivals to put together, for the first time ever, a touring season called ‘South Africa at 20: The Freedom Tour’, marking the 20th anniversary of democracy in the country. Thanks to its participation in this exciting tour, which is a partnership between the South African Department of Arts and Culture and the British Council, CAFF is screening a rich selection of South African titles, from 1994: The Bloody Miracle, a compelling documentary, presented by director Meg Rickards, that immerses us in the context of the first democratic elections in South Africa; to the fresh and first ever South African street dance film, Hear Me Move, a vibrant portrayal of contemporary youth that closes the Festival and is followed by a live performance by South African singer Joyce Moholoagae. The festival line-up explores other themes, such as oppression, migration and the arts, and pays tribute to young filmmaker Bakary Diallo, who passed away in the tragic crash of Air Algérie Flight 5017. CAFF also highlights work by women filmmakers, inviting debut Nigerian-British director Destiny Ekaragha to speak at the screening of her comedy Gone Too Far. Not only a celebration of film, CAFF is hosting a free seminar at the Fitzwilliam Museum on ‘Africa & Photography’, led by Spanish artist Javier Hirschfeld, whose exhibition ‘Más Morena’, adapting Spanish art to Senegalese subjects, will be at the Arts Picturehouse for the whole month of November. There will also be a workshop on South African popular songs as well as live music at the opening and closing of the festival. CAFF is sponsored by Trinity Collegeand the Centre of African Studies, University of Cambridge. CAFF has also received strong support from prestigious organisations such as the Cambridge Arts Picturehouse and the Cambridge Film Trust, the French Society at Trinity College, Cambridge-Africa Programme, the Centre of African Studies at the University of London, The Fitzwilliam Museum, Key Travel, The Humanitarian Centre, and the African Society of Cambridge University. The main venues for the festival are the Arts Picturehouse and the Winstanley Lecture Theatre at Trinity College. Tickets are on sale as of Friday 3 October.